Learn the spaced repetition method for memorizing bodies of facts. Have an easy, reliable, quick access to each individual fact. Notice and use more number patterns. Notice that we say access, not recall. Most people don’t memorize facts like 2*2, 1*7, or 10*9, because they can calculate the answers very easily. Strongly visual people often close their eyes to access facts (to imagine some pictures), auditory people mutter, and kinesthetic people move their fingers. These techniques aid either memory or calculation, and should be encouraged. Which of the following methods of memorizing serve Goal 1, 2, or both? Answers with comments are at the end. Memorizing by reciting times tables (*2, *3, *4…) plus training access to individual facts out of order. Using pictures and stories with mnemonic clues for the multiplication facts. Memorizing by patterns plus training access to individual facts out of a pattern. 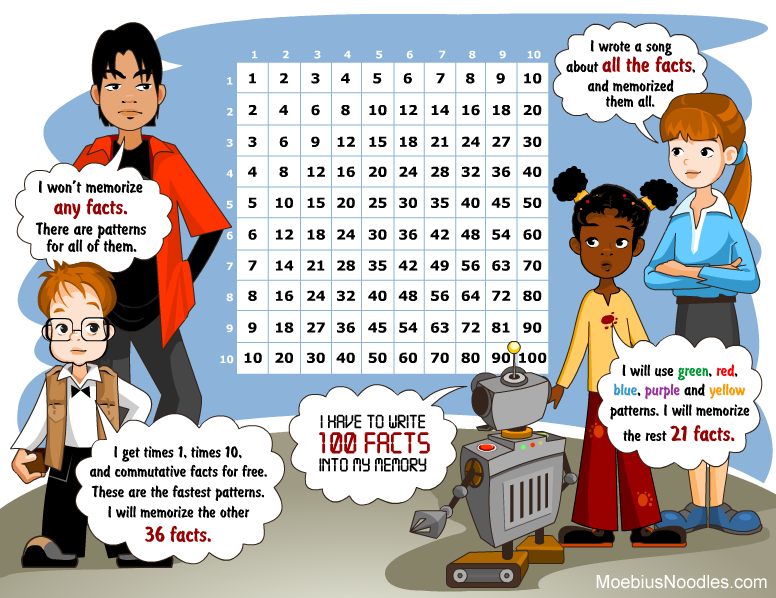 This activity is for people who consider memorizing multiplication facts. We do not have enough data to tell you whether memorizing times tables is a good idea, mathematically speaking. But many people will like this as a mental exercise, just as people enjoy memorizing music and poetry. Many will find it useful for social reasons. We recommend memorizing by patterns plus training facts out of order. You are down to 36 facts from 100, without doing any memorization! You may cross out even more patterns, for example, many people remove times two. Also cross out individual facts you happen to know. Now pick a pattern from the list of what is left, and use the spaced repetition method on these facts. Make cards for each fact from one pattern. Write the multiplication (such as 3*9) on one side of the card and the answer (27) on the other side. Cross these facts out in the table to mark your progress. Make three boxes for the cards: Easy, Good, and Again. Place all your cards in the Again box for now, multiplication side up. Take the stack from the Again box, shuffle it, and try to access each answer in your mind. Then turn the card over to check yourself. If you accessed the fact as fast as you want, and correctly, move it to the Easy box. If you accessed the fact a bit too slowly but correctly, move it to the Good box. If you could not access the fact, were very slow, or made a mistake, do a micro-exercise for your memory. Say the fact out loud: “Three times nine is twenty-seven” and/or imagine any visuals that go with that pattern, such as a three by ten array with the top three counters crossed out. Put the card back into the Again box. If your Again box is empty, congratulation! You made great progress on that pattern. Refill the Again box with new cards, from the next pattern you want to tackle. Work with your Good box once a day, and with your Easy box once a week. Occasionally, you may need to move a card back from Easy to Good, or from Good to Again - that’s fine, don’t worry. Eventually, all cards will migrate to Easy. Workouts should be under two minutes. We highly recommend the free software Anki. You can make a deck of Anki cards for each pattern. The software will keep track of which card to use, and how often. In the long run, it is much easier to use and more efficient than paper cards. You can use the same tool for learning foreign words, scientific terms, flags of the world, and other bodies of facts. As an example, you can download MariaD’s deck of some squares. Help your kid make all the choices about the process. When during the day is it better to do this work? Which patterns to train, and which not to train? Which pattern comes next? If you work with paper cards, help to make the cards and their boxes beautiful. But don’t decorate cards with stickers or extra pictures, because that will mess up your memory. You can decorate the boxes. I thought there were no pre-requisites for the activities in this course. Doesn’t my child need to know numbers first? With children who do not yet know number symbols, use dots arranged in meaningful patterns, or objects that show quantities. Say the description out loud. Only use two or three cards or toys at one setting, unless your kid insists on more. Make it possible to answer with pointing or picking the right object, rather than words. Easy, reliable, quick access to each individual fact. Noticing and using more number patterns. Only two methods serve both goals. Of these, #2 (Memorizing by reciting times tables (*2, *3, *4…) plus training access to individual facts out of order) takes longer, is less engaging, and will serve the second goal less than #6 (Memorizing by patterns plus training access to individual facts out of pattern). We recommend that method, #6. If you do #2 (Memorizing by reciting whole times tables in order (*2, *3, *4…)) or #5 (Memorizing by patterns), Goal 1 is at risk, because you have to access the whole list or pattern. 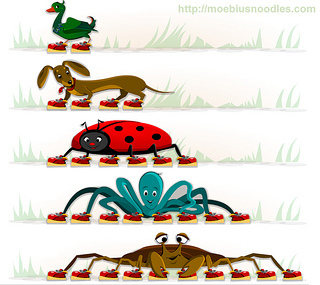 More dangerous are #3 (Memorizing songs) and #4 (Using pictures and stories with mnemonic clues for the multiplication facts), and other non-mathematical mnemonics. They can jeopardize you seeing mathematical patterns, thus your understanding of algebra. Though songs are less dangerous, since people are less likely to overuse them. Our son has had his multiplication facts memorized for some time. He was really young when he figured out on his own it was skip counting or repetitive addition. He also loved playing on reflex & timez attack. From this class he enjoyed seeing multiplication in everyday life and finding patterns all over the place. As well as trying to recreate things in scratch or minecraft.